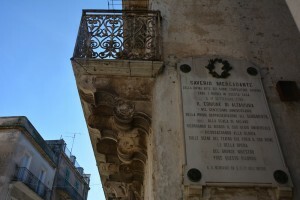 The territory of Apulia, which is a narrow strip of land, can be subdivided into five sub-regions; three of them – Gargano, Murge, and Salento – are composed of a powerfu lsequence of limestone rock that was deposited in a shallow sea during the Mesozoic Age, between 200 and 100 million years ago. 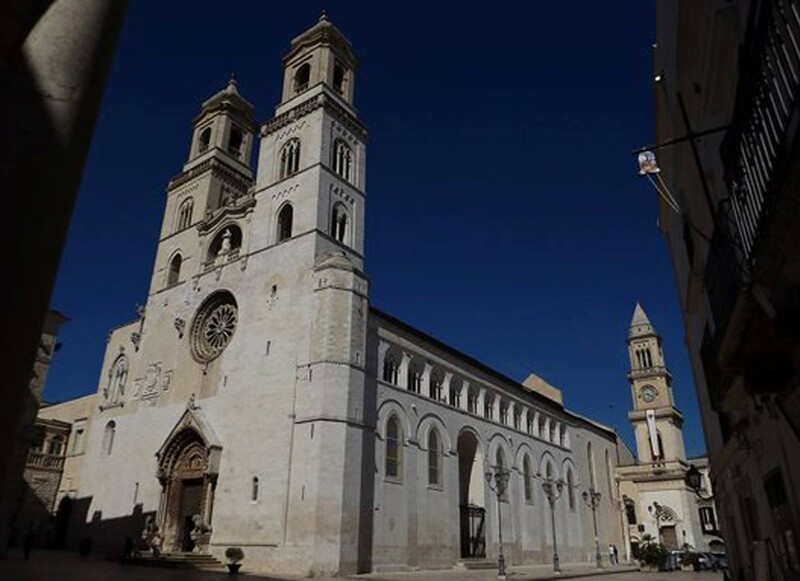 In particular, the Murge is a wide area of tablel and, 50 Km wide and 150 Km long, of a basically rectangular shape, with a North-West to South-East orientation; it is placed mostly in the province of Bari, whilst a minor part of it is located in the provinces of Brindisi and Taranto. 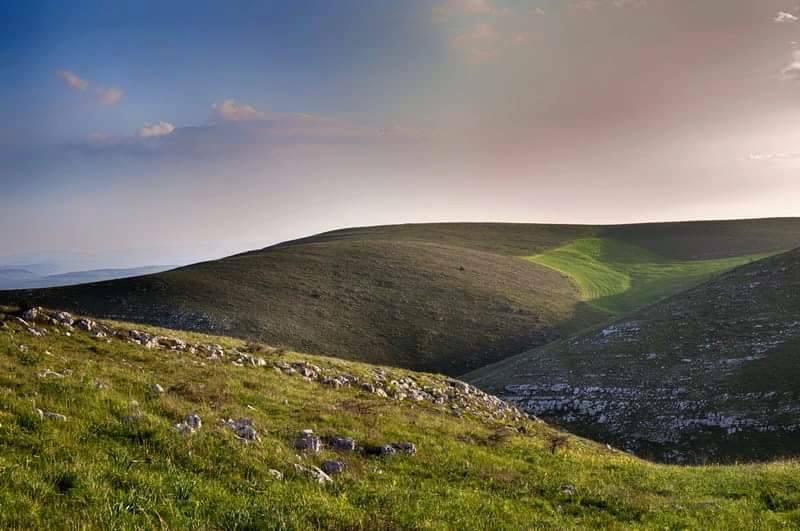 The northwestern portion, called “Murgia Alta”, that is high Murgia, is a slightly hilly tableland area sloping towards the Adriatic Sea by a series of blunt-edged terraces. The whole area is marked by karstic phenomena related to the dissolution of calcium carbonate stone by rainfall, which has given rise to caves, swallow holes and dolines – some of them quite large and deep, locally termed as “puli” (see the pulo of Altamura). This area is almost stripped bare of vegetation and poor in surface running water on account of the thick mesh of stone cracks that channel all the rainfall towards the underlying karstic water layer; it is a bleak landscape where traditional forms of human settlement have been preserved. 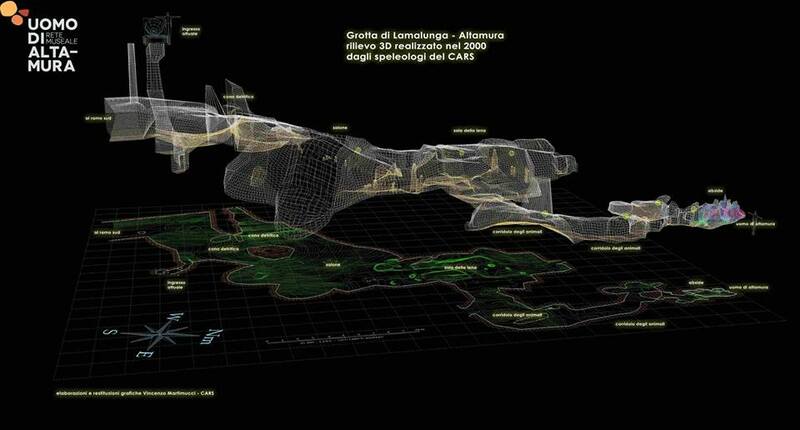 In addition to these landscape features, the Altamura area includes items of outstanding cultural and archaeological interest as shown by two locations – the De Lucia quarry, with thousands of dinosaur footprints dating back to about 70 million years ago, and the Lamalunga cave, where the only complete skeleton of a man existing in our world dating back to 130,000- 100,00 years ago. Both of them bear a unique testimony to the history of Earth and to the evolution of our species. 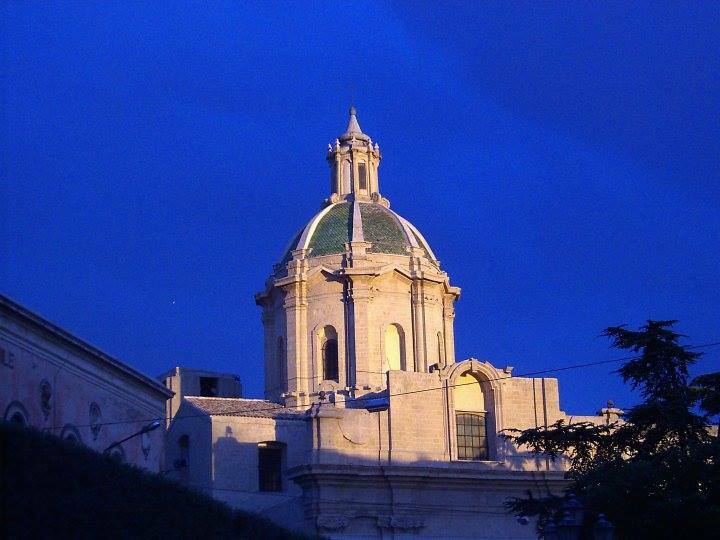 The park is spread over a steppic territory that goes from Barletta coastup to the calcareous plateau of the Murgia that marks the border with Basilicata. 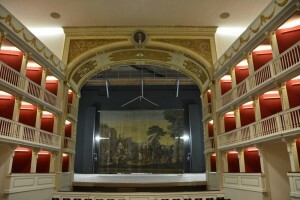 Some of the most interesting towns of Apulia like Altamura and the architectural masterpiece of Castel del Monte, a historic hunting reserve of Frederick II, are within the area concerned.The foundation of the park is due to the significant natural values of the territory – which is one of the most important steppe areas in Italy, with the presence of various endemic flora and one of the largest populations of birds of the steppes. 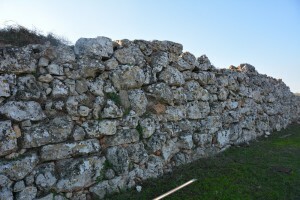 The area has also a high landscape and cultural value and, thanks to the presence of karst phenomena that shaped the limestone of the area (making possible the original rural architecture: “jazzi” or sheep farms, farmhouses, snow-houses, shrines, dry stone walls) numerous prehistoric remains such as the finds of the Altamura Man.The main aspect of the territory is characterized by landscapes almost “lunar” that are the result of an action of a thousand years old erosion caused by the wind and the rainwater which have shaped over the centuries the calcareous plateau forms, by creating an exceptional heritage of karstic phenomena. The most widespread are the karstic basins and sinkholes like the Pulo of Altamura with its 550 meters in diameter and 92 meters deep and the Pulicchio of Gravina. The most obvious consequence of the karst is the almost total disappearance of surface hydrography, perennial watercourses that is perennial watercourse such as lakes and streams, of which today only the numerous erosion furrows, the so-called “lame” remain.The underground hydrography is much more developed and can reach up to 400 meters below sea level. The most common forms are underground wells, sinkholes, chasms, caverns and caves, often adorned with stalactites and stalagmite formations like the cave of Torre di Lesco. 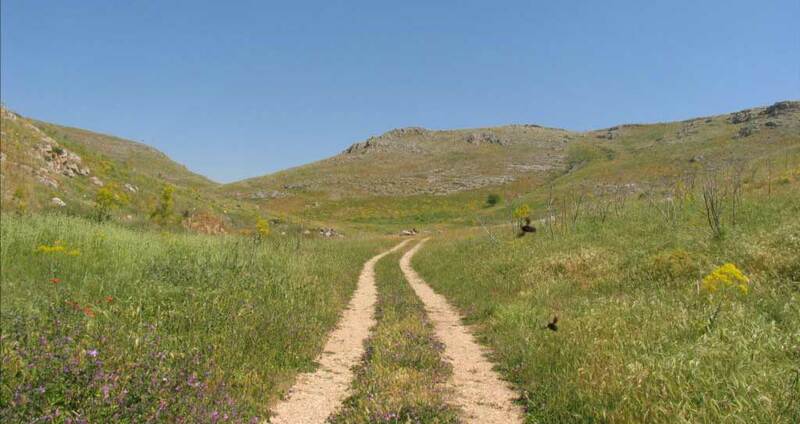 Most of the Murgia area, today, is covered with sub-steppe vegetation of the herbaceous or low shrub type.Today the presence of oak trees along the northern border facing towards the Adriatic prevails. In this area about 1,500 plant species have been counted, that is 25 percent of the species present on the whole national territory. Of particular relevance and variety are the micro-landscapes of lichens, mosses, steppe grasses or lands in which some sort of stipa commonly called ‘flax of the fairies’ grows.In the pasture, we find the most representative endemic species among whichwild orchids, some are bushy, other arboraceous. The grass layer is mainly composed of graminaceous plantsand it is distinguished by the presence of ferule (a type of giant wild fennel plant) and asphodels. In the woods the prevailing species are the downy oak, theQuercus trojana(another type of oak), the Kermes oak, holm oak, turkey oak and quercus farnetto. 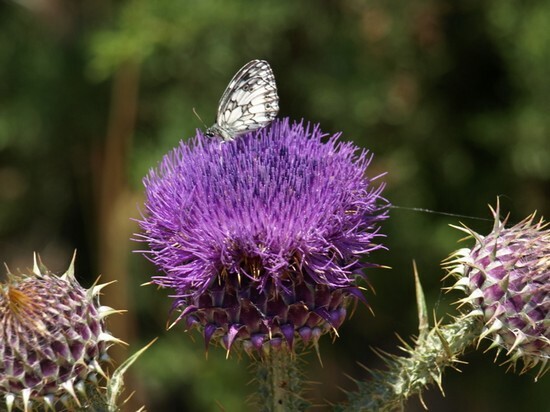 The fauna that colonizes these environments has adapted itself to the vegetation, although hunting and the environmental changes have led to extinction many species from the beginning of this century like the wolf, the Egyptian vulture, the wild cat, the little bustard. Small animals prevail (insects and other invertebrates, small birds, micro-mammals).The wild birds of this area are characterized by about 75 species, mostly related to open environments, cereal crops, pastures, uncultivated grounds. In fact, many birds nest directly onto the ground like the grille, theshort-toed lark,the Skylark, the crested lark and the woodlark. 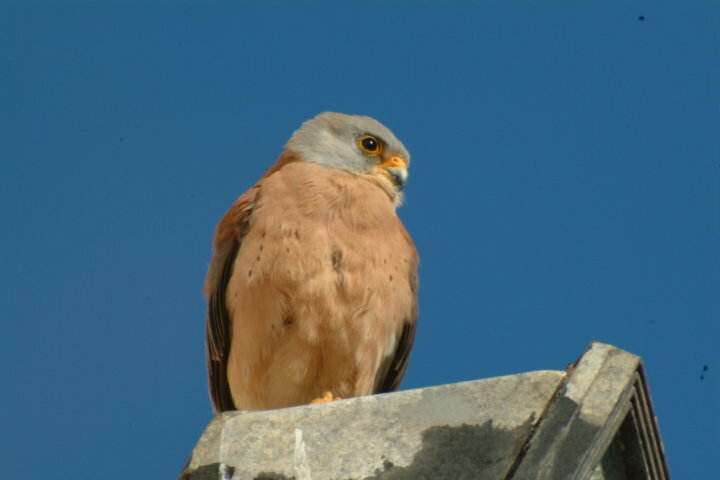 Of particular interest are the birds of prey; besides the buzzard, the sparrow hawk and the Lanner, the High Murgia houses the largest and most numerouspopulationof Kestrel hawk in Europe, best known as the lesser kestrel, recognized by the EU as “priority conservation species “. Amphibians by their nature arefound in the vicinity of karst ponds, tanks or wells. 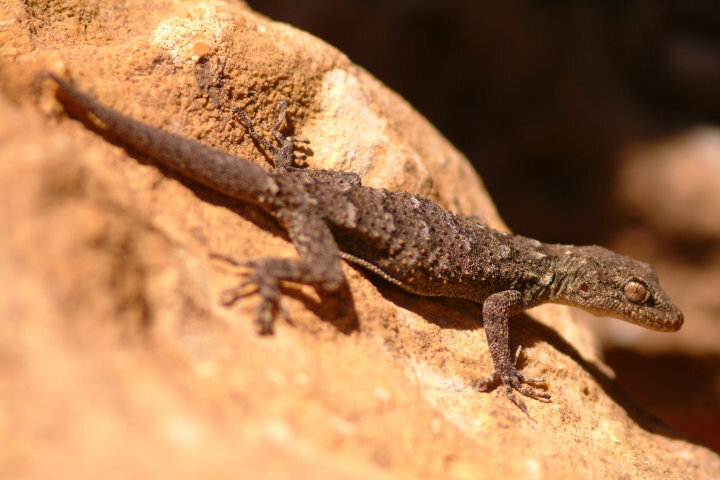 The arid and rocky environment that characterizes the High Murgia is the ideal habitat for many species of reptiles. Among these, because of the fact that they present only here, the gecko Kotschy and leopard snake arouse interest. The populations of thecommon tortoise are also significant. The class of mammals registers smaller presence, with about 25 species, among which the shrew, the Savi’s water vole, the field mouse. Among the predators the fox, the weasel, the marten must be enumerated. In the few forest areas the rate and the porcupine are present. 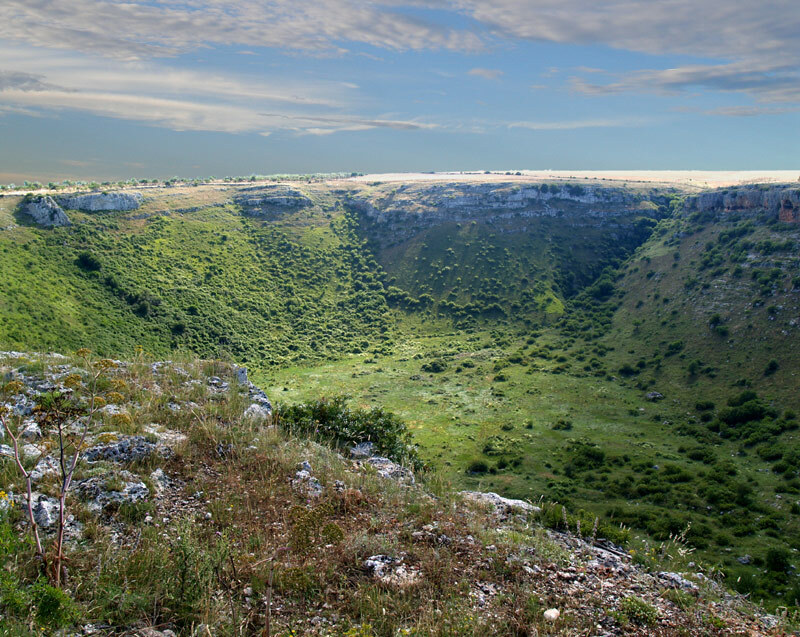 The famous Pulo of Altamura, located approximately at 6 km from the city, is a glimpse into the horizon, without a doubt the most impressive karst of High Murgia, a huge sinkhole with a diameter of about 500 meters and 92 meters deep. Despite its look as much like a crater, its origin is not volcanic, but karstic.The walls of the northern slope, which are those in almost vertical slope, have numerous ravines and natural caves probably inhabited in prehistoric times by hominids, that with the natural evolution process would have given rise to the species to which the Man of Altamura (dating to Neanderthal man times) and his clan belong, whose discovery occurred in a place not far away from the Pulo.Thanks to its special microclimate, the Pulo has become an ideal habitat of several rare plant and animal species in the rest of the Murgia, like the raven that nests on the steep walls of the Pulo. 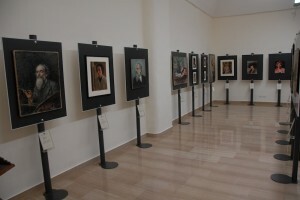 Many of the objects found here are now preserved in the National Archaeological Museum of Altamura. The High Murgia park displays an intense variety of flora and fauna, in a diversity that gives the landscape a unique and characteristic image. Thanks to the variety of animal and plant species the air is enriched with aromas and it is filled with recalls, while the backgrounds fade away from the dense foliage to the subtlety of the stems, or crumble violently to the instantaneous passage of a bird of prey.The flora stands up proudly at the height of the landscape in which it germinates. The oaks rise domineering, asthey are the large majority in the area, accompanied in smaller numbers by the cypress and the Aleppo pine. To the latter, since 1930, active reforestation plants are dedicated which extend themselves as much in the internal areas as in those coastal regions of Puglia for about 25 thousand hectares. The natural pastures are populated by almond trees, medlars and olive trees, while the steppe soils are covered by the herbaceous vegetation: there are many species of wild orchids growing in these areas. Among the wildlife many species that are also very curious must be included. The steppe is seen overflown by an important amount of diurnal birds, including the so-called Lesser Kestrel, while at night you can listen to the sounds of birds of prey such as barn owls, long eared owls or eagle owls, among the most common. The presence of the hawk proves surprisingly very important in the urban context, since its laboriously manufactured nests blend in with the architecture of the village, in a very genuine and artistic fusion. But the natural treasure of the High Murgia does not end with the birds. Many are the amphibians that tred on its soil, such as the Italian newt or the viper. As for mammals, it is very common the encounter with foxes, weasels, martens, but also rates and badgers, while the appearance of wolves is rarer. The lesser kestrel is a bird of prey belonging to the Falconidae family. It is the smallest of the family as it measures just 33 cm in length with a wingspan of 70 cm. You can distinguish the two sexes for the different colour of the plumage. The male is brown with shades of gray, while the female is reddish brown, with black strikethrough.Very similar to the kestrel, the Lesser Kestrel can be recognized by the absence of dark spots on the back and for the colouring of the paws which are yellow, while in the kestrel are black. The lesser kestrel has a very wide area of deployment that includes Europe, Asia and Africa. In Europe you can find it in the southern regions such as Spain, Italy, Portugal, Greece, Poland and the former Soviet Union. It tends to spend the winter in Africa in particular in the Mediterranean regions. 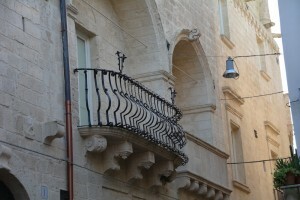 In Italy it is present mainly in the southern regions such as Puglia, Basilicata, Calabria, Sicily and Sardinia. The natural habitat of the lesser kestrel is made up of barren lands, arid and open with low vegetation, composed mainly of grass and shrubs, where it is able to find food more easily. In winter it settles in the African savannah. It is a migratory species and attends our country during the breeding season, between March and September. 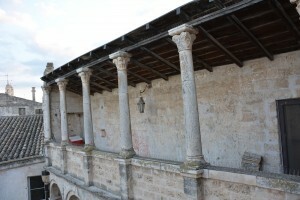 The lesser kestrel nests mostly in caves and holes in Puglia and Basilicata, located under the roof spaces and in the facades of the old buildings of historic centers. The lesser kestrel owes its name to its eating habits. 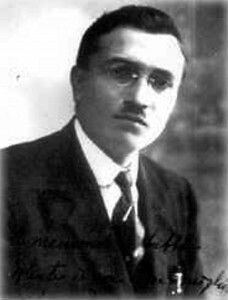 His diet, in fact, is composed mainly of insects such as crickets, grasshoppers and beetles. Although not equipped with powerful claws, it can occasionally capture rodents and lizards too. The hunt takes place on the ground with the ambush technique. The lesser kestrel is a very sociable bird of prey and does not fear the presence of man. 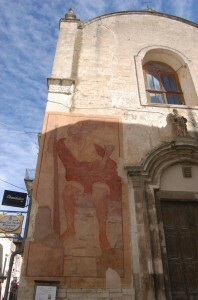 Dinosaur Footprints, The Man of Altamura, The bread of Altamura. 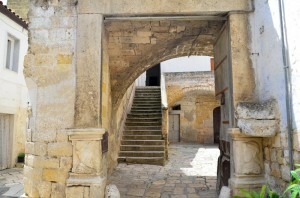 The uniqueness of Altamura is also attested by thousands of dinosaur foot prints that have been discovered in 1999 outside the city, in De Lucia quarry, in Via Santeramo. Over 25.000 foot prints of at least 5 different species of dinosaurs have been preserved in the Altamura mud. The stratigraphic layer probably dates back to the Cretaceous period, more precisely the santonian period (83,5 – 85,8 million years ago). 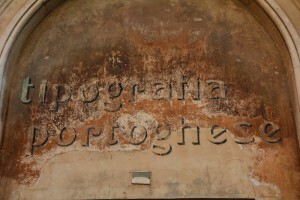 It is the most important and best preserved discovery in Italy and in Europe. 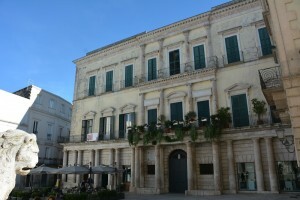 The climate in Apulia, during that time period, was very different from today’s one: a tropical climate, much warmer. This permitted the conservation of the prints; they were dried by the sun before they were covered by other calcareous layers. One can imagine these animals moving around on a sort of muddy plain, a clear carbonate mud in which they left their imprints, quite deep even. In some foot prints it is possible to see the holes where mud was taken attached to the foot of the dinosaur. 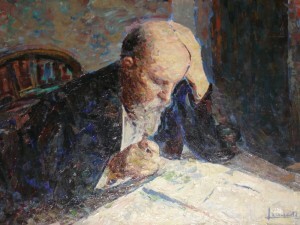 In some cases, one can see the articulation of the foot or the folds of the skin. The footprints that have been studied so far have been ascribed to the ornithischian dinosaurs, probably ornithopods (with three toes). Marginocephalia and thyreophora are not escluded. All of these dinosaurs are herbivores. It is assumed that these dinosaurs were smaller than their contemporaries. The area in which they lived was geographically isolated. Therefore, there was less room and need for them to evolve as enormous as other dinosaurs. The prints are important because they can give information about different aspects: the skeletal motor apparatus, posture, the walk, behavior, speed and environmental preferences of dinosaurs. The site also offers a contribution to paleo-environmental and paleo-geographic reconstructions. Infact it changed the previously assumption of a partially submerged region that was thought to be the Murgia millions of years ago. Dinosaurs need a large and stable environment in order to find enough food. The quarry is a candidate for UNESCO’s world heritage list. The footprints left by dinosaurs in the De Lucia quarry,cannot be visited for the time being as they will be shortly undergo restoration work and hopefully they are expected to be included in an ad-hoc archaeological park. 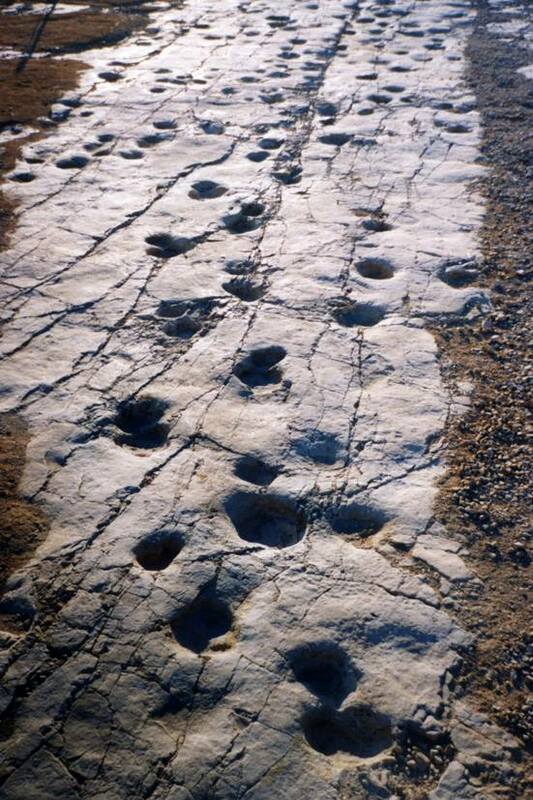 Dinosaur footprints have been discovered in various places in Italy (Liguria, Veneto, Tuscany, Campania, Sardinia). 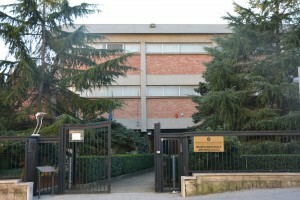 For instance, at the ichnological site of Lavini di Marco (Rovereto, Trento region), footprints and trackways related to over 200 dinosaurs from the Jurassic period (Liasperiod, about 200 millions years ago) have been detected. 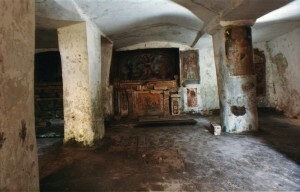 However, the De Lucia Cave, with its thousands of footprints is a unique site. Although they had remained intact for so many years they started to deteriorate in the last 14 years and so a urgent action needed to be taken. The expropriation of the quarry by the Superintendence of Cultural Heritage, announced in 2011, has finally occurred. Let’s just hope that the severity of neglect lasted years (and still ongoing) may come to an end and serious work can start to prevent the numerous foot prints from undergoing more vandalism and erosion due to the atmospheric agents. In October 1993, a group of spelaeologists exploring the Lamalunga cave, one of the numerous karstic caves in the region, run into the complete skeleton of a prehistoric man dating back to about 130,000 years ago. 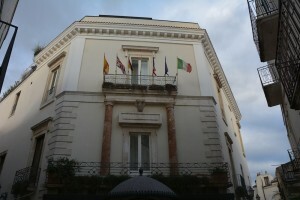 The man had remained trapped in the cave, which is part of the Altamura Murge area and is currently one of its most significant elements. It is made up of several galleries extended not far beneath the limestone surface, which is crossed by vertical pits. At a given stage in the long history of the cave, it is difficult to say precisely when, the palaeontological findings were deposited and subsequently dispersed on account of the periodical inflow of water; later on, the findings were covered by concretions. The maingallery in the cave, which is currently inactive and suspended on the bottom of the valley, can be accessed via a verticalpit, at whose base collapsed stones and an imposing depositconoid can be found. On the soil there are spread mostly complete bones of animals, which show higher concentrations in some areas; they belong to hyenas, deers, fallowdeers, and horses and are covered by a thin calcareous sheet as well as, in some cases, by “coralshaped” concretions. The same concretions, producing a major visual impact, cover the remains of the human skeleton located in the area called “the Man’s Apse”. Some of the bones, in particular the overturned skull, were moved about by the inflow of water that in the past was present in the cave. They are of outstanding interest for human palaeontological studies, as they provide a unique opportunity for studying the only complete skeleton existing in the world that appears to be especially well preserved also in its most fragile anatomic parts, such as the internal walls of the orbits. The decision not to remove the skeleton from this site, the skeleton being cemented to calcareous rock, has increased the difficulties and time required for an in-depth study; still, image analysis allowed attributing it to an archaicHomo sapienss howing some features that will be typical of Neandertalians. 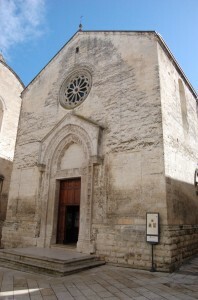 To ensure the conservation it is not possible to visit the paleontological remains within the Lamalunga cave, but scholars and visitors can view a recorded footage of the cave in its minute details through monitors placed both the Archaeological Museum of Altamura and to Masseria Ragone Lamalunga, the latter is located at just 800 meters from the cave of the Altamura man. Examining the bones, it is clear that it concerns a male (one can tell from the pelvis) of about 1.60 or 1.65 meters in height (measuring the femur) who probably reached an age of 35. The skull is very interesting because it shows characteristics of two human species: most (the face, the jaw and the long flat head) are characteristic for the Homo erectus (who made his way into Europe about little over 500.000 years ago). But the pronounced ridges over the eye sockets are characteristic features of the Neanderthal (Homo sapiens neanderthalensis) who was in Europe possibly as early as 300.000 years ago and became extinct around 28.000 years ago. 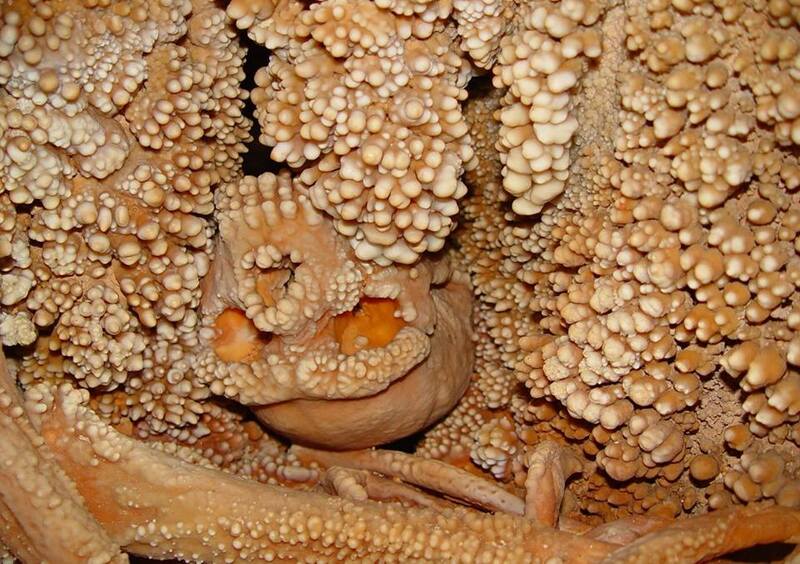 Thus modern Italians (or humans) do not derive from this skeleton or these species. Theory is that the man (while hunting) fell down into the cave (from the original entrance) and was unable to come out and eventually starved to death. He did not break anything in the fall. He probably walked around in search of an exit and arrived at end of the cave. Know that thousands of years ago the cave was different and some narrow passages were more spacious for sure. Note that inside the cave there’s no light besides arriving from the entrance. A total darkness can lead to panic. Other theory is that he died outside the cave and was washed inside by water or the water washed him into the corner. The bone sample, recovered in 2009 that corresponds to a portion of the right scapula, has allowed the DNA extraction and the measurement of certain morphological characteristics.The new findings place the skeleton in a period between 170 thousand and 130 thousand years ago, that is the final phase of the Middle Pleistocene, unlike most European Neanderthal artifacts that date back to the the Upper Pleistocene, instead. “This is therefore a unique fossil of inestimable scientific value. It is the oldest and most completeNeanderthal specimen of which the DNA is also known. 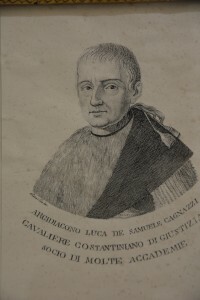 A study, thanks to different imaging techniques applied to the skeleton found in the Lamalunga cave, in Puglia, reveals the face of the Man of Altamura. 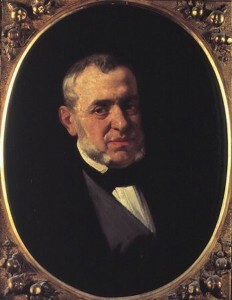 In fact, two Paleo-Dutch artists Adrie and Alfons Kennis, were able to reconstruct the face of the Man of Altamura. 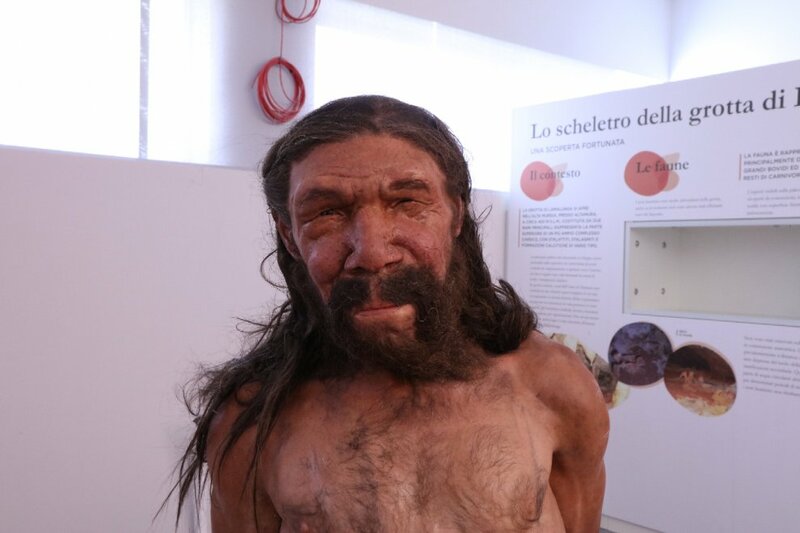 The reconstruction shows that the Man of Altamura had a stocky body, a wide pelvis, not very high in stature, about 1.65m, a bulging forehead, an elongated skull in the rear part, a big nose probably due to the adaptation to the penultimate glaciation. The most striking finding of the research is the skull, which has just a very archaic shape, that is why the finding is extremely important. This reconstruction will open a new era of research that will hopefully clarify important aspects of human evolution.The Altamura Man model will be exhibited in a dedicated area for the new museum center of the Apulian town which will be inaugurated in the coming months. 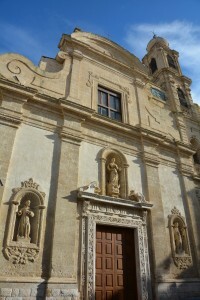 The operation, promoted by the municipality of Altamura and the Archaeological Superintendence of Puglia region, has benefited fromthe data obtained in more than five years of study and analysis, conducted through collaboration between Italian scientists and cavers of the Altamura speleological research center (CARS). 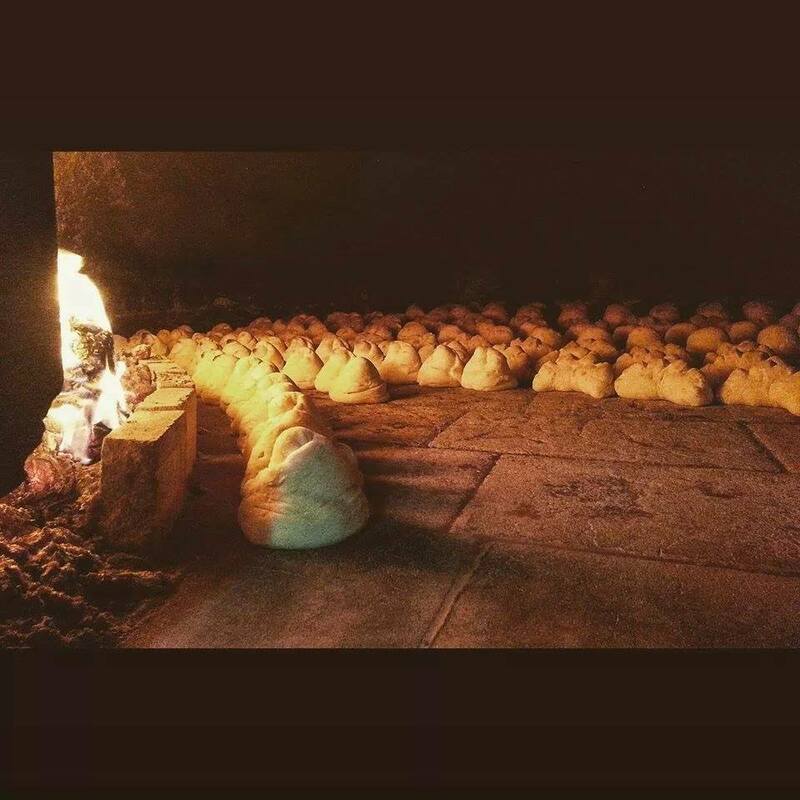 The bread, as a basic element of the diet in the Alta Murgia populations, traditionally produced in large pieces, in his characteristic form, called “u sckuanète”, was mixed and kneaded largely by women in their homes, and taken topublic bakeries in order to be baked. The production of the bread was therefore a choral act, socially and culturally, in which the family and the private sphere came into contact with the public one. To prevent the loaves from getting mixed up, the baker used to mark them with the initials of the owner or the head of the family, initials which were printed on an iron stamp. Only then did he proceed to bake themThe main characteristic of the bread was the durability, indispensable to ensure the sustenance of farmers and shepherds in the weeks they would be spending away from home, working in the fields or pastures, on the Murgia hills. The lunch consisted for these workers basically of a bread soup flavoured with extra virgin olive oil and salt. 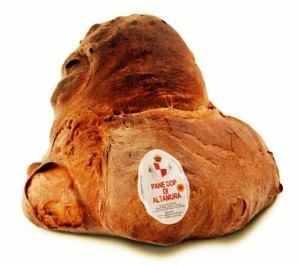 Altamura bread is still produced today,since the Middle Ages,following the ancient recipe handed down by farmers and shepherds throuh generations. 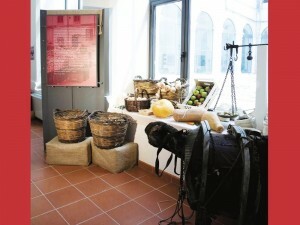 The ingredients have remained the same over the centuries – durum wheat flour, natural yeast, salt and water – as well as the manufacturing process which consists of five stages: mixing-kneading, moulding, rising of the dough, shaping, baking in a wood burning oven.Today “Altamura’s bread” is the center of an intense industrial production, capable of responding to the needs and trends of the market, though maintaining a strong sense of continuity with tradition by keeping its original identity and working skills within a technologically modernized and an ever increasing automated context. One of the most significant aspects of “Altamura’s bread”, together with its flavour and digestibility, is its prolonged capacity of preservation (the bread keeps its nice taste for two/three days from the date of production). This bread is largely consumed nowadays. It was traditionally kneaded at home and taken to the neighborhood’s bakery where the baker used to give the dough the overlapping shape, mark it with a wooden or an iron stamp on which the initials of the head of the family were engraved. Then He would bake it and, about an hour later, he would open the oven in order to allow for the formed crust to dry out and become crusty. When the baking was finished, the baker, after the bread had cooled down on wooden planks, used to have the bread delivered house – to- house on the wooden planks of the same type previously used to pick up the dough. 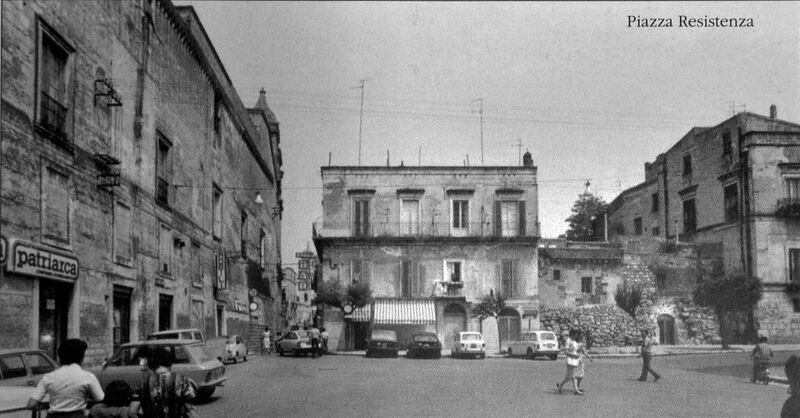 The baker-delivery was paid with a piece of raw dough (about 300 g.), known in the local dialect as “cecì”. This bread was traditionally made for farmers and shepherds housed to live on it during their long stay sat the farms (usually 15 days). The kneading, molding and baking processes are the same as those used for the overlapped bread. Today, due to the modernization of the milling techniques, instead of durum wheat flour, re- milled wheat flour (“semola in Italian”) is commonly used, which gives the bread its straw-colouring instead of the traditional amber one. Traditionally made and eaten while waiting for the sckuanéte (overlapped bread) to be baked. The name derives from the necessity to satisfy children’s desire (tantrum) to eat bread without waiting. Votive bread made for the religious festivals of Saint Antony of Padova (13th June); Saint Joseph (19th March) and Saint Anne, patroness of bakers (26th July). It is blessed on small altars set up in private houses and distributed to followers who often used to keep it in the kitchen of their homes for a whole year as a symbol of protection. 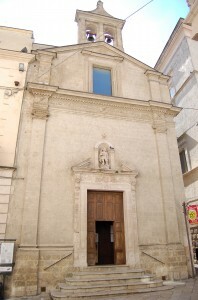 At present time Saint Antony’s bread is also made for the festivals of Saint Rita, who is venerated in Saint Augustine’s church, and of the Madonna del Buoncammino (Our Lady of the Good Travel), in the sanctuary consecrated to her. This bread is made for the festivity of the Immaculate Conception (8th December). Once it was the only bread to be eaten on the vigil of the festivity (7th December), after the Cathedral’s bell had struck noon. At present the Immaculate’s bread is made solely by bakers and it is sold retail or on request. 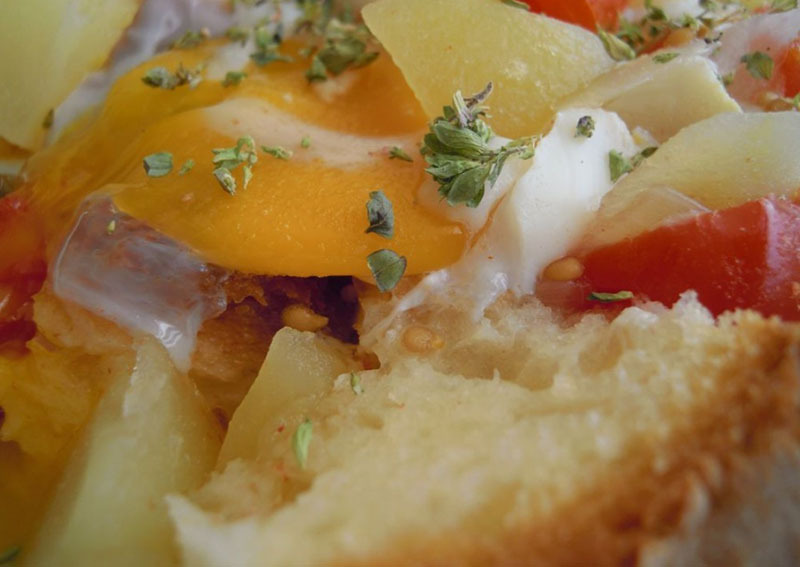 The culture yeastis the most important ingredient of PDO Altamura bread. It is a naturally prepared yeast that confers to the product a significant contribution to its digestibility and long shelf-life. 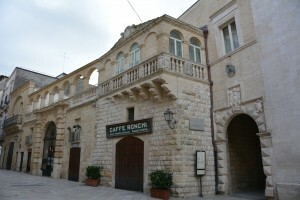 Other ingredients are water, certified by Acquedotto pugliese, sea salt and durum wheat re-milled flour (semolina) derived from durum wheat varietes “appulo”, “arcangelo”, “duilio”, “simeto”, which are cultivated within the territory of the following municipal areas of: Altamura, Gravina in Puglia, Poggiorsini, Spinazzola, Minervino Murge. The bread of Altamura was the first European product to be awarded the prestigious DOP conferred to it by the European Union in 2003 in the product category “Bread and bakery products”. The”Protected Designation of Origin”, known by the acronym PDO, is a legally protected trademark attributed to those food products whose quality characteristics depend on the geographic production. 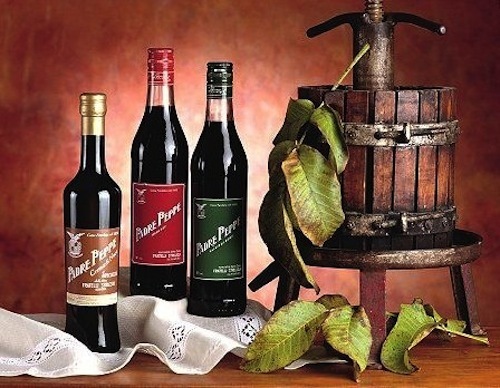 The combination of these elements allows to obtain a top-quality product, unique and inimitable flavour, taste and colour.The European disciplinary about the D.P.O. bread recognizes two shapes: the overlapped bread (u skuanète) from the high shape and the priest’s hat bread (u cappidde de Prevete) from the low shape. It is the label that guarantees consumers the certainty of the PDO. It is applied directly onto the bread prior to its baking, or glued on a microperforated wrapping used for the packaging of bread loaves.